Thanks for posting thi. You, Sir, made my morning. Any way to daisy-chain multiple MSP430 Launchpads ? 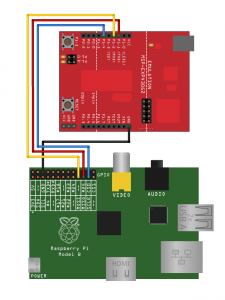 What’s the advantage to connecting the RasPi and the Launchpad this way instead of over USB? I’m REALLY new to CCS and the MSP430. Could you clue me in to what I might be doing wrong? It looks like the MSP430 code was built with GCC rather than CCS (despite the comment that says “Built with CCS Version 4.2.0”). The syntax used for interrupts and intrinsics varies between compilers. On IAR you need to make the same changes but use __no_operation() instead of _no_operation(), there is a double underscore at the beginning as defined in the intrinsics.h file. Just a quick note. Don’t go by the comments in the MSP430 code. MOSI is P1.2, and MISO is P1.1. It’s shown reverse of that in the comments. Cost me a couple of hours find out why I was receiving all 0xFF on the SPI slave. Excellent example. Now I can use MSP430 as DAC, and MCP3208 as an ADC for my project. Otherwise, I was thinking of using an Arduino. Thanks for all the work it took to put this together. Followed all the steps and it ran perfectly the first time. Only thing I had any issue with was loading the api drivers. Never could get spidev to show up with lsmod. 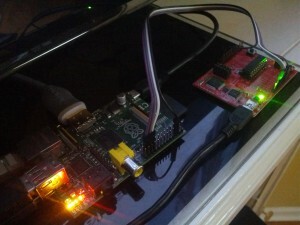 But I think the spi drivers are handled through raspi-config now. Anyway, now all I have to do is go back through code and understand exactly what’s going on here. I am long time C programmer but new to the MSP430 and SPI. I have a question, how do you send the “Hello World” to the MSP430. Do you need a terminal like putty? Or is it possible to use the Arduino terminal? I’ve done everything, but I’m stuck at that part. I type in Raspbian terminal ./spidev_test, and it only prints the lines indicating the mode, the speed and the bits per word, but I have no idea what to do next.